Two Brooklyn wrestling promoters go to French Algeria in search of a famous Algerian wrestler but accidentally end-up in the French Foreign Legion. Rocky and Puddin' Head are waiting tables at an inn on Tortuga when a letter given them by Lady Jane for delivery to Martingale gets switched with a treasure map. Kidd and Bonney kidnap them to Skull Island to find said treasure. Two newspaper photographers get mixed up with gangsters at a ski resort. When their captain is swindled out of his riverboat by a trio of gamblers, stage show star Abbott and his bumbling sidekick Costello must put things right. Two sidewalk salesman enlist in the army in order to avoid jail, only to find that their drill instructor is the police officer who tried having them imprisoned. BUD ABBOTT LOU COSTELLO in the CHOKE of the Century! Ted Higgins: We're as honest as the day is long. Tommy Hinchcliffe: That includes Daylight Savings. 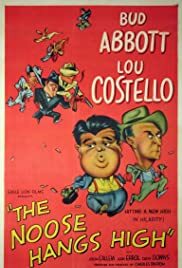 Very funny Abbott & Costello comedy that has the boys crossing a bookie (Joseph Calleia) and trying to find a way to pay him back $50,000 of his money they lost. Nicely paced with one great routine after another. I don't think there were any clunkers here. Sometimes the boys used bits that felt stale like they were dusted off vaudeville routines from twenty years before, but not here. Even the reworked gags feel fresh. Bud and Lou are in top form in this one. They had me in stitches. Great support from Calleia, Leon Errol, Mike Mazurki, and Alvin Hammer as a racetrack tout in one of the more subtly funny scenes. It's one of my favorite A&C comedies that didn't have monsters or the supernatural as part of the plot.